"Stop playing videogames and finish your homework!" "But Mum, the game is my homework!" Olds College and Concordia University are two of an increasing number of schools that have set videogames as required coursework. In order to get their diplomas, students at Olds College must complete a Farmville-style iPad game: Lemonade Stand, in which they open a virtual lemonade stand and gradually build it into a business empire. 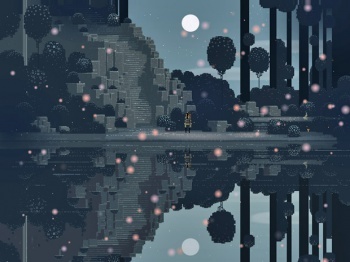 Meanwhile Darren Wershler, an English professor at Concordia University, has assigned the adventure game Superbrothers: Sword & Sworcery as required reading for his class. "What we've done is take the things that make computer games so addictive and apply them to education," said Toby Williams, the Olds College's director of entrepreneurship and international development. He says Lemonade Stand helps develop the students' entrepreneurial skills in a fun and engaging way. "Students, I think, are excited to see the things that are important to them reflected in their coursework," said Wrshler on setting videogames as reading assignments. "It definitely broadened my thinking about what counts as literature." But it's not just the world of tertiary schooling that is experimenting with videogames in class. Toronto elementary school teacher Liam O'Donnell plans to introduce Minecraft to his Grade 1 class at Withrow Public School this year. He found that basing writing exercises on the students' experiences in the game helped overcome the lack of confidence that made many of them refuse to even try writing. "They were all so filled with their own stories." How long will it be before we are studying Half-Life instead of Hamlet in high school English classes?